“If you build it, they will come” is the motto of BridgeSat, a company building a network of laser-equipped ground stations for high-speed communications with satellites. Builders of satellite laser-comm technology have described a “chicken and the egg” impasse to true adoption: one needs both an optical ground segment and in-space optical terminals for the system to work. 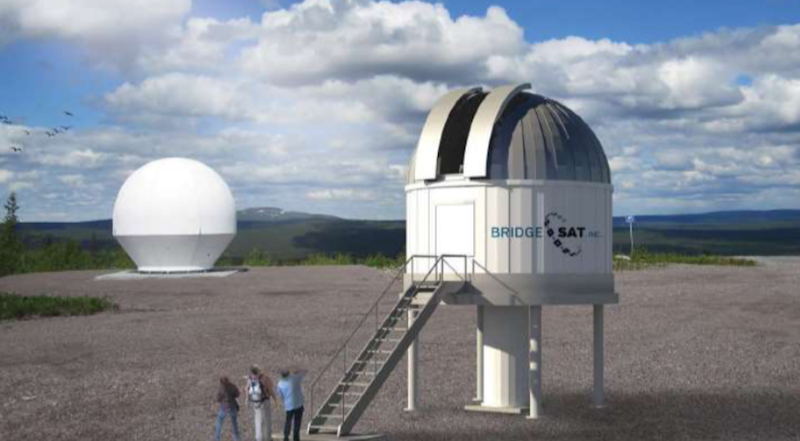 BridgeSat aims to build 10 ground stations around the world by the end of 2019, creating a network of sites that can handle substantially larger amounts of data than today’s radio-frequency stations to connect satellites back to the Earth. The first station is under construction at the Sierra Remote Observatory near Fresno, California, with operations scheduled for July, Matsumori said. Projects like NASA’s laser-terminal-equipped Lunar Atmosphere and Dust Environment Explorer spacecraft and the European Space Agency’s SpaceDataHighway program have demonstrated the technology, which requires very precise pointing across thousands of kilometers, can work. Tesat-Spacecom, manufacturer of the optical terminals on the five-satellite SpaceDataHighway network, is now ready to commercialize the payload technology for other spacecraft. Zech said Tesat-Spacecom of Backnang, Germany, is nearly finished developing two commercial laser terminals, one for cubesats that can beam 10 gigabits per second between spacecraft at distances up to 6,000 kilometers, and another for 10 Gbps space-to-ground communications. Target customers for these systems are low-Earth-orbit constellations, he said. Matsumori, who took the helm at BridgeSat after previous careers at Qualcomm, Virgin Orbit and SpaceX, said BridgeSat is working with Tesat-Spacecom and Thales Alenia Space to create optical terminals that will work with the BridgeSat network. Terminals from other manufacturers will also work with BridgeSat’s ground network, he said. BridgeSat’s target customers are remote-sensing operators whose satellites collect large volumes of imagery and need to quickly dump that data to clear memory for new observations. Iceye, the Finnish startup that launched a 70-kilogram synthetic aperture radar satellite in January, agreed in May to use BridgeSat terminals and the company’s ground network. Like the transition from copper wires to fiber optic cables, ground stations that use optical terminals can support substantially higher throughputs. That means remote-sensing satellites can beam down more pictures, and telecom satellites can devote more in-space radiofrequency resources to revenue generation, Matsumori said. A single optical ground station “can download terabits easily” during the minutes when a satellite passes overhead, he said. Bill Ostrove, an analyst at Forecast International, described laser-comm as having a lot of potential not only for greater throughput, but because it doesn’t require coveted radio-frequency spectrum. “As radio waves become more crowded and more data is being demanded of satellites, it’s a way of increasing bandwidth and avoiding radio-frequency crowding issues,” he said. The catch is optical links are weather sensitive — cloud cover blocks the beams, disabling communications. Matsumori emphasized site diversity — having stations spread out geographically in sunny regions — so that if one station is blocked, another can take its place. To streamline regulatory landing rights approvals, Matsumori said BridgeSat is working with local partners to co-locate optical ground stations with established radio-frequency sites. Neither BridgeSat nor Tesat-Spacecom are alone in developing optical communications systems. Boston startup Analytical Space, which declined to comment for this article, is designing a network of laser relay satellites, with radiofrequency cross links and optical downlinks. Ball Aerospace and Honeywell teamed up in April to build laser terminals for communications between ground stations, satellites and aircraft. Large telecom constellation programs from LeoSat, Telesat, and SpaceX, all anticipate using optical intersatellite links. Airbus’ four Pleiades Neo satellites, scheduled for launch in 2020 on two Vega C rockets, will feature Tesat-Spacecom optical links to patch into Europe’s SpaceDataHighway. Tesat-Spacecom’s Zech said the company is building up manufacturing product lines to create terminals for constellations and other programs.